Some people must be excited to see these folks. After all, companies are still sending out hundreds of sales reps (often college kids on break) into neighborhoods all over the country to make appointments for services or sell products, so the practice must be effective. Many people, however, dread the ring of the doorbell on a weekday afternoon. How do you get rid of the door-to-door salesman, once and for all? We have an idea. Unquestionably, the best way to (legally) keep solicitors from knocking on your door is to display “No Soliciting” signs. Think we’re biased because we’re a sign company? The Supreme Court of the United States has repeatedly ruled that while many local laws that restrict solicitation are unconstitutional, privately posted signs are a legitimate way to tell salespeople to leave you alone. In the words of one Supreme Court opinion, “The Court has traditionally respected the right of a householder to bar, by order or notice, solicitors, hawkers, and peddlers from his property.” Put differently, by posting a sign that states that you do not want to receive solicitors, you are effectively telling anyone attempting to solicit that they are not welcome on your property. In almost any part of the United States, those who remain on your property against your express instructions are breaking the law. Takeaway: Putting up a “No Soliciting” sign is the best action that you can personally take to protect your privacy. Still not convinced? Here’s why other attempts to stop salespeople aren’t as effective as a tried and true “No Soliciting” sign. Why aren’t there laws that ban door-to-door soliciting altogether? We’re glad you asked. The first thing you need to know is that the door-to-door salespeople canvassing your neighborhood have a constitutional right to be there. In 1976, the U.S. Supreme Court stated that speech that, “does no more than propose a commercial transaction” is protected by the First Amendment (Virginia State Board of Pharmacy v. Virginia Citizens Consumer Council). Since that case, the Supreme Court has upheld free speech for commercial purposes. So, the door-to-door salesperson on your front porch is protected by the First Amendment, though there are some legal restrictions that can be placed on his or her activities. Court rulings related to door-to-door soliciting typically deal with the delicate balance between the solicitor’s right to free speech and the homeowner’s right to privacy on their private property. Most cases arise when a city passes a local ordinance that restricts the activities of solicitors in some way and an organization affected by the law sues the city for violating its First Amendment rights. In the paragraphs below, we discuss some of the most important cases about solicitation and why they are important. After that, we provide a detailed breakdown of “No Soliciting” laws adopted by major cities in all 50 states. Before we get started, though, we need to note a brief disclaimer: we are not attorneys and the information that we provide should not be read or interpreted as expert legal advice. Although we hope that this post will be a valuable resource, readers should consult their local statutes as they make signage decisions. When the city of Stratton, Ohio passed an ordinance that required “canvassers” to register with the city and obtain a permit in order to go door-to-door, a group of Jehovah’s Witnesses filed a lawsuit that ultimately landed in the Supreme Court. The Stratton law allowed residents to complete a “No Solicitation registration form” in which they selected the groups that they were willing to receive, if any. The Jehovah’s Witnesses argued that the law trampled on their First Amendment rights to free speech and freedom of religion. The Supreme Court sided with the Watchtower Bible and Tract Society, ruling 8-1 that the ordinance violated the rights guaranteed by the First Amendment. Thus, requiring canvassers to register and obtain a permit to go door-to-door was deemed unconstitutional. Many municipal solicitation ordinances include a time frame during which door-to-door salespeople may operate. These rules are usually intended to preserve both citizen privacy and safety (since criminals sometimes pose as door-to-door salespeople in order to “case” potential targets, scam customers, or force their way into homes). In the end, however, the Supreme Court and other appellate courts generally consider these time restraints to be unconstitutional. In 1987, the U.S. Court of Appeals, Seventh Circuit, ruled that a Watseka, Illinois ordinance that limited door-to-door solicitation to the hours of 9:00 a.m. and 5:00 p.m., Monday through Saturday, was in violation of the First Amendment. The city had created the ordinance because citizens had complained that door-to-door salespeople were interrupting their dinners and generally being an annoyance. The city was also concerned that the salespeople might contribute to crime in Watseka and thatlcrimes were more likely to be committed after 5:00 p.m. The Court of Appeals found that the ordinance, “impermissibly infringed upon the First Amendment rights” of the defendant. The Court pointed out that under Watseka’s current laws, “Even Girl Scouts will have a difficult time selling their cookies by 5:00 p.m.” While the Watseka case didn’t involve Girl Scouts, the Court reasoned that some citizens might welcome the opportunity to speak with salespeople, and would be in need of the services or products offered. This is a good point—after all, who wants to miss out on an opportunity for some Thin Mints? In other words, while city time restrictions may be unconstitutional, signs are an effective and acceptable way to prevent solicitors from ringing your doorbell. In another case which pitted the right to solicit against homeowner privacy, solicitors came out on top once again. The City of Englewood, Ohio implemented an ordinance that, among other things, prohibited solicitors from going door-to-door after 6 p.m. In a legal battle that lasted almost seven years, the U.S. Court of Appeals, Sixth Circuit found that the city’s registration and time restriction requirements were both unconstitutional because they infringed on free speech. While solicitor time restrictions were overturned in both of these cases, Circuit Courts around the U.S. have repeatedly allowed restrictions on the “time, place, and manner” of the solicitation, provided that the restrictions are reasonable and narrowly tailored. Because the ordinances for Watseka and Englewood both imposed stringent time limitations, the ordinances were overturned on the grounds that they were overly broad. Cities that want to regulate soliciting would do well to remember—the narrower the ordinance, the more likely it will be upheld in Court. The Court’s ruling suggests that blanket bans on solicitation are simply not constitutional. Privacy can, however, be protected by other means like signage. Based on the rulings above, your chances for enjoying a quiet evening, free of uninvited visitors are looking rather slim. Rest assured, all is not lost. If you really don’t want annoying door-to-door salespeople bothering you, you do have one course of action: Post a “No Soliciting” sign and let the law or ordinance work for you. Though a salesman may have the right to be in your neighborhood, he doesn’t have the right to knock on your door if you have a sign posted stating that he’s not welcome to infringe on your privacy. The reason that Courts have repeatedly ruled that anti-solicitation ordinances violate the First Amendment is because most of these laws take the decision of whether or not to listen to a solicitor out of the hands of the individual citizen. On the flip side, the Courts have repeatedly reasoned that “No Soliciting” signs strike an appropriate balance between the homeowner’s right to privacy and the solicitor’s right to freedom of speech. So, do “No Soliciting” signs really work? Are they legally enforceable? In a word, Yes. Statements from several Supreme and Circuit Court opinions confirm that signs are an effective, legal solution to your solicitor problems. As the Supreme Court stated in Watchtower, homeowners’ ability“to post ‘No Solicitation’ signs, coupled with their unquestioned right to refuse to engage in conversation with unwelcome visitors, provides ample protection for unwilling listeners.” By using a sign, you can effectively express your desire to not be disturbed. It depends on where you live. As you will see in our breakdown of “No Soliciting” laws in major U.S. cities, most local laws proscribe penalties for solicitors who ignore signs that prohibit solicitation. That said, many local laws have exemptions for political, charitable, and religious groups who are not attempting to sell a product or service. On the other hand, many ordinances specifically state that even religious canvassers must respect “no solicitation” signs. Occasionally, people become frustrated because religious groups seem to repeatedly ignore their “No Soliciting” sign. Why do they do it? The confusion can probably be traced to how the word “solicitor” is defined. Religious representatives may ignore your sign because the word “soliciting” is usually associated with commercial sales of some sort. 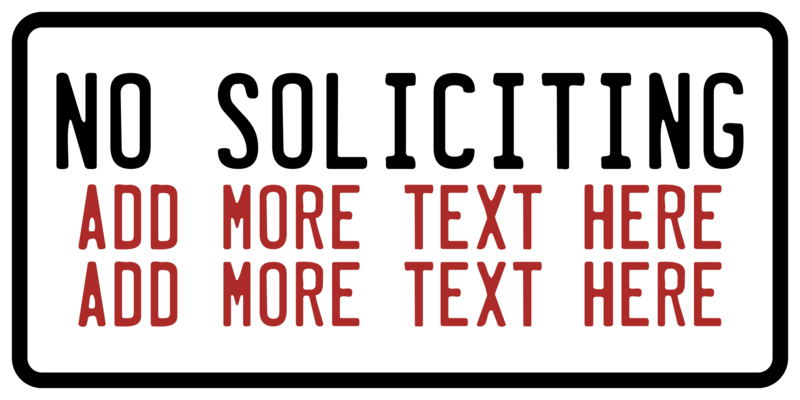 In fact, some local laws explicitly define “solicitor” as a person who is attempting to sell something (in the traditional sense of the word “sell.”) If you continue to receive calls from proselytizing organizations against your wishes, you have two options: either create a custom sign that specifically states the types of inquiries you will not accept, or politely ask the canvassers to depart. Once you decline to receive anyone that arrives on your property, they are legally required to leave. What are some tips for making my “No Soliciting” sign effective? Do salespeople sometimes ignore signs? Unfortunately, yes. There are, however, a few things that you can do to maximize the effectiveness of your sign in deterring unwelcome visitors. One idea is to post your “No Soliciting” sign at the entrance to your property. If you have a fenced front yard, you could post the sign on your gate. Otherwise, you might use a wood stake to put your sign in the ground. By doing so, you can drive home the point that you would really rather not be bothered. Solicitors may be less likely to expend the effort to walk to your front door if they know that they will probably be rejected. Another strategy to discourage solicitors from ignoring your “No Soliciting sign” is to create a custom sign that references your local statute. By including a reference to your municipal ordinances, you back yourself up with the authority of the law, giving your sign instant credibility. What if my city doesn’t have laws that forbid solicitation at homes with “No Soliciting” signs? Even if your city doesn’t have a law that specifically addresses “No Soliciting” signs, chances are that your sign will still work. When you put up a sign, you are essentially stating that solicitors are not invited on your property in writing. Those who disobey your express instructions to leave the property might be guilty of trespass (depending on how your local laws are construed). Can I use a “No Soliciting” sign at my business? For the most part, yes. While some local ordinances discuss “No Solicitor” signs solely in terms of their application to private homes, many also state that solicitors are not allowed to approach businesses that display signage. It is, however, somewhat of a common practice among salespeople to ignore signs. So, even though your everyday sign might not always work, making a custom “No Soliciting” sign can help ensure that you can keep running your business without interruption. If you do post signs, make sure that your employees know that they are free to express themselves at any time that they are not on the clock at work, in accordance with their First Amendment rights to free speech. If your employees misinterpret your sign to mean that their speech is restricted, you could land yourself a visit from the National Labor Relations Board. Can a Homeowner’s Association ban all salespeople with “No Soliciting” signs at the entrances to the community? While municipal ordinances vary widely, most local laws allow salespeople to ignore “No Soliciting” signs at the entrance to a community. By doing so, cities leave the decision of whether to listen to a solicitor up to individual households. Any family can still post a “No Soliciting” sign and expect to have their requests heeded by solicitors. There are, of course, exceptions to the typical case. For example, if your entire community can be accessed only by private roads (as is often the case in gated communities), solicitors cannot enter if there are signs at the entrance. Local laws may also specifically restrict access to communities that have signs posted at community access points. Are there protections for consumers who buy from door-to-door salespeople? As we stated previously, the door-to-door salesperson in your neighborhood has every right to be there. And she has every right to knock on your door to see if you want to buy her stuff (unless you personally post a sign). The fact that door-to-door salespeople have the right to canvass your neighborhood isn’t all bad—some people like the opportunity to see the goodies that companies offer. Even you might want to buy her stuff… especially if she’s selling cookies. In an attempt to protect citizens against faulty products, many cities require solicitors working within their boundaries to post a solicitation bond before they can go from house to house. The idea behind the solicitation bond is that if a product is faulty or part of some type of scam, any victimized consumer can claim a portion of the money to reimburse the losses that they experience because they bought the product. Check your local ordinances to see if your city has a law that requires solicitors to put up a bond before they can work. If they do, you can verify whether the salesperson at your door has paid the bond before you purchase from them. The seller must also give the consumer a cancellation notice (found in the law above) at the time of the sale. Many cities have adopted “cooling off” rules in their municipal codes, which may provide consumers with even more protection than the federal regulation. If you are trying to return a product that you bought from a travelling salesperson, you may want to consult your local statutes for a similar law. See the Federal Trade Commission’s article on the cooling off period for more information. Are there Legal Guidelines for Municipal Restrictions on Door-to-Door Sales? 2. Serve a legitimate governmental objective. 3. Leave open ample alternative channels of communication. 4. Be narrowly tailored to serve the governmental objective. To be content neutral, the law in question should not target or favor a certain group. For example, laws that are designed to limit the activities of a particular religious group would not be considered content neutral. The term, “governmental objectives” sounds ominous, but basically it’s just referring to the government’s interest in protecting its citizens from crime and also protecting citizens’ rights to privacy. The phrase “narrowly tailored” essentially means that the law must proscribe the least restrictive means to accomplish the government objective. In general, the best advice for municipalities that wish to pass an ordinance that restricts solicitation is to make the law as narrow as possible in order to avoid a lawsuit. Local ordinances often address “No Soliciting” signs. Many ordinances will specifically state that solicitors must not attempt to contact any residence where there is a “No Soliciting” sign. For instance, in West Jordan, Utah, the ordinance regarding residential solicitation says that door-to-door salespeople must a) check for “No Soliciting” signs b) If a sign is present, the salesperson must forego all efforts to solicit and c) leave immediately. The city of West Jordan also states that it’s a crime to violate a “No Solicitation” notice by ringing the doorbell, knocking on the door or otherwise contacting anyone on the property. Many cities also have laws that require solicitors to obtain a permit or license and establish hour restrictions for those going door-to-door. Although ordinances in some locations have been ruled unconstitutional (see above) most local laws at least somewhat different than those that were overturned. As we have emphasized repeatedly in this post, if you want to get rid of door-to-door salespeople for good, your best bet is to put up a “No Soliciting” sign. Will some solicitors ignore your sign? Perhaps, but if they do, your knowledge of your local laws will help you turn away unwanted visitors and maybe even report them to local authorities. 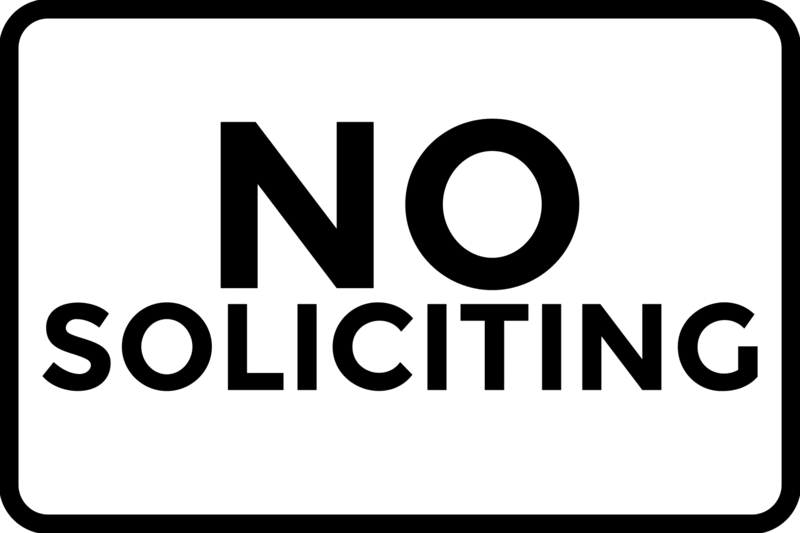 To get your sign, click on one of the customizeable “No Soliciting” templates (the pictures throughout this post) to make a sign that fits your needs. You can browse a variety of “No Soliciting” signs by clicking here. If you can’t find something you like, start from scratch to create a sign that is uniquely yours. If you need help at any point in the design process, be sure to take advantage of our free design services. As a resource for you, we have created detailed descriptions of “No Soliciting” laws for many different locations in the United States. Because “No Soliciting” laws are typically created and enforced at the local level, we outline the ordinances in major cities within each state. 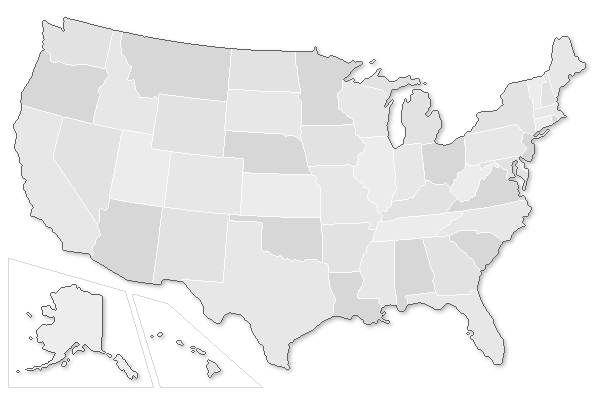 To see if we have summarized the laws in your city or town, click on your state in the map below. Even if your city isn’t listed, chances are you will find useful resources that give you an idea of the laws that might be present in your area. 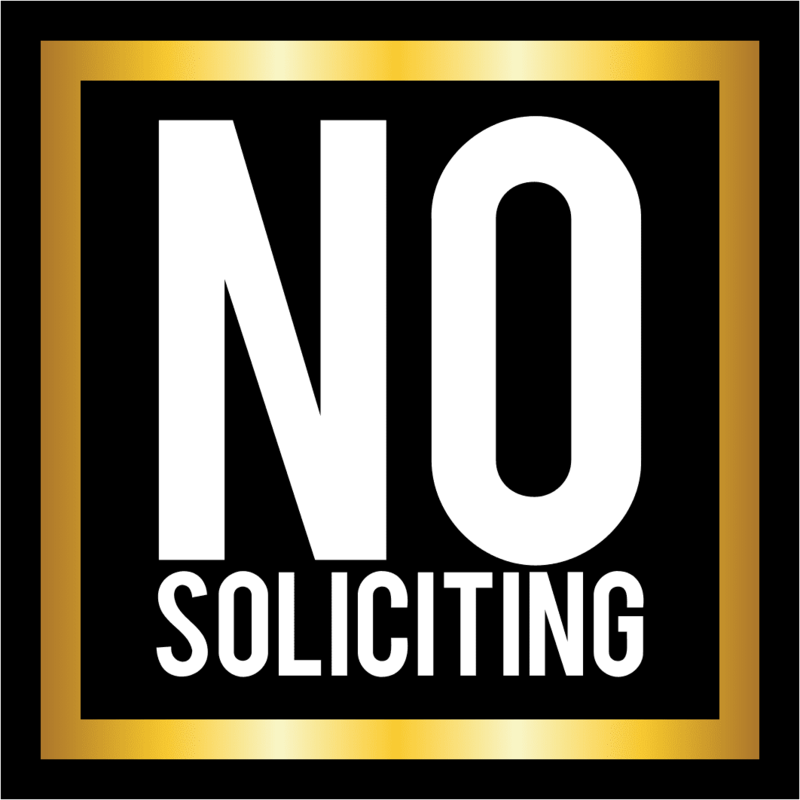 Remember, you can start creating a custom “No Soliciting” sign by clicking on any of the graphics in the post. Local ordinances in Montgomery, Alabama state that solicitors and canvassers may not contact any residence or business displaying a sign that states “ “ or something similar. Montgomery regulations also impose a time limit on solicitation—those going door-to-door must limit their activities to the hours between a.m. and p.m.
Huntsville, too, has laws that prevent solicitors from knocking on doors where there are appropriate “No Soliciting” sings. Any solicitor who knocks on a door with a “No Soliciting” sign or fails to leave after being asked to do so could lose their permit to solicit in the city. This permit and the accompanying photo identification badge must be obtained before a solicitor is allowed to go door-to-door. Non-profit and religious groups are not required to get a permit. Finally, soliciting times in Huntsville are limited to the hours between 8 a.m. to 8 p.m. The rules for solicitors in the Anchorage Municipal Code apply primarily to those fundraising for non-commercial causes. Chapter 10.35 requires those seeking funds to obtain a non-commercial solicitor’s license from the municipal clerk and prohibits them from attempting to contact households where there is a sign or notice that prohibits soliciting. The City of Phoenix has detailed rules about door-to-door solicitation. The Phoenix City Code (Section 23-143) states that solicitors must immediately leave any property that has a sign or notice that prohibits soliciting and may not open or walk through any door or gate that has such a sign. The same applies if the residence has a “no trespassing sign” posted. Section 23-141 of the city code goes on to state that soliciting is restricted to the hours between 9 a.m. and 9 p.m. from April to September and between 9 a.m. and 7 p.m. from October to March. Solicitors must carry with them a government-issued form of identification (such as a driver’s license) and produce that ID upon request (Section 23-142). Even kids who are selling door-to-door are expected to have a government or student ID with them at all times. So if you are really sick of the neighbor kids hitting you up for Sally Foster gift wrap, you can always sic the cops on them for failing to carry photo identification. In all seriousness, solicitors who don’t follow these rules can be charged with a class one misdemeanor. The municipal code for Fayetteville, Arkansas contains provisions that make it illegal for solicitors to enter the grounds of or attempt to contact any private residence that has a sign that states “No Soliciting” or a similar phrase. The company for whom any salespeople work must obtain one principal business permit (40 dollars) as well as a solicitor’s permit for each salesperson (5 dollars each), which requires an official state criminal background check. Peddlers can only perform their labors within the hours between 10 a.m. and 9 p.m. The violation of any of these rules could result in a fine. (See Chapter 116 of the Fayetteville Code of Ordinances for specific language and additional regulations). The city of Springdale enforces similar rules for solicitors. The Springdale code allows solicitation only within the hours of 10 a.m. and 7 p.m. (or 8 p.m. during Daylight Savings). As in Fayetteville, two permits are required and solicitors must observe “No Soliciting” signage. Furthermore, any salesperson working within the city must have on their person a copy of Section 82-1 of the city ordinances (which contains all of the soliciting laws that we describe here) as well as their city-issued permit and employer-provided photo ID. These requirements do not apply to representatives of religious, political, or charitable causes. No solicitation laws in San Diego, California (§33.14 of the San Diego Municipal Code) require that solicitors “immediately and peacefully” leave any residence where a “no solicitation” sign is posted. The letters on “no solicitation” sign must be at least ½ inch high in order to have legal effect. According to the law, this rule applies to “interviewers” such as survey researchers, political canvassers, and even representatives of religious and charitable groups. Ignoring this law is strictly prohibited. Commercial solicitors must obtain a police registration card in order to hawk their wares. This process involves filing finger prints with the San Diego police department and provided a photo for the registration card and police files. Neither commercial nor non-commercial solicitors (“interviewers”) may contact households between 8 p.m. and 9 a.m. unless they have an already established appointment. The City of Los Angeles requires solicitors to carry with them government-issued identification as well as a Business Tax Registration Certificate. No person may solicit sales or charitable/religious donations between the hours of 8 p.m. and 8 a.m. (See section 41.43.1 of the Los Angeles Municipal Code for exact language). Solicitors in Denver, Colorado must obtain a peddling license in order to work in the city. The person soliciting must carry their license card with them at all times that they are going from house to house and show it to any prospective customer or police officer that asks to see it. Furthermore, Sec. 47-18 of the Denver Code of Ordinances makes it illegal for any solicitor to “attempt to solicit business at any place which maintains a sign or other visible and legible indication that such solicitation of business is not desired or is prohibited.” Solicitations are prohibited ½ hour after sunset and before 8 a.m. The city of New Haven, Connecticut requires solicitors selling goods to obtain a license to solicit. The city code (section 3-17-9) also prohibits solicitors from going door-to-door before 9 a.m. or after sunset. This law also outlaws a number of potentially deceptive and fraudulent practices. Children who are younger than 16 years old are not allowed to work as door-to-door solicitors. No solicitation laws in Delaware are established at the state level. Section 4405 of the Delaware Code states that solicitors must obtain and carry a door-to-door salesperson identification card from the Delaware Department of Finance. Once salespeople have the required identification, they can only go door-to-door between the hours of 9 a.m. and 8 p.m., Delaware time. The City of Jacksonville, Florida specifically states that “No Soliciting” signs “constitute sufficient notice to any solicitor or peddler . . . that any peddling or soliciting by any person is prohibited at such residence.” In other words, Jacksonville law considers a “No Soliciting” sign adequate notice that solicitors are not allowed on the resident’s private property. Jacksonville Code also requires commercial solicitors to obtain a permit and limit their work to the hours between 9 a.m. and 9 p.m. Solicitors must be older than 18 to work unaccompanied, and older than 14 to work with the help of an adult supervisor. These laws are all contained in Part 250.7 of the Jacksonville, Florida Code of Ordinances. It is worth noting that the laws appear to apply primarily to commercial solicitation, not religious, charitable, or political canvassers. The Miami Code of Ordinances (Sec. 39-47) makes it illegal to solicit, peddle, or canvass at any location that displays a sign that states “No solicitors,” “No peddlers,” or “No trespassing.” The sign must use letters that are at least 1 and ½ inches high. In Atlanta, local ordinances (Sec. 30-618) state that solicitors may not enter or attempt to contact any residence that has a “No Soliciting” or “No Peddling” sign. Those who ignore properly posted signs could be cited for criminal trespass. Atlanta also requires door-to-door solicitors to obtain a permit, which requires both an application fee and an annual renewal fee. Tax-exempt groups do not have to obtain permits, nor do salespeople with regularly established routes. After combing through regulations for the state of Hawaii and most major Hawaiian cities, we weren’t able to find much on “No Soliciting” signs. The city of Honolulu does have an ordinance that requires peddlers to be licensed by the city (Sec. 29-6.2). In general, however, it is fairly safe to assume that if you express your desire not to receive solicitors they are obligated to leave your property. Boise, Idaho has detailed regulations (Chapter 5-12of the Boise Municipal Code) about the conduct of door-to-door solicitors within the city. Solicitors are not allowed to enter the premises of any location where a sign is posted that says “No Solicitation Allowed” or “No Peddlers Allowed.” Those who violate this law may be charged with a misdemeanor and fined 300 dollars. Additionally, any salesperson attempting to sell goods or services in residential areas must obtain a license from the city, which requires the person seeking the license to pay a fee and provide personal information to the City Clerk. Tax exempt, charitable, political groups and children are not required to get this license. Chicago’s municipal code (10-8-271) states that no commercial advertising materials (flyers, handouts, etc.) may be left at homes that display a sign that states “No Soliciting” or “No Trespassing” at or near the front door. Those who violate this law may be fined between 200 and 1,000 dollars. When it comes to charitable fundraising, any charity that attempts to raise funds by going door-to-door must obtain a permit from the city of Chicago. See 10-8-080 et seq. for more information. In Indianapolis and Marion County, Indiana, it is illegal for salespeople to attempt to sale goods or services at any private residence where there is a sign or notice near the entrance that forbids soliciting or peddling (Revised Code Sec. 391-104). Solicitors in Des Moines are also required to be licensed with the city and to post a refundable bond to protect against fraudulent sales tactics. Furthermore, door-to-door sales are only allowed between 8 a.m. and 9 p.m. The city of Overland Park, Kansas has an ordinance (5.64.020) that states that no salesperson may knock, ring the doorbell, or attempt to contact any home or apartment where there is a sign that says “No Solicitors” or “No Trespassers.” According to the legal definitions of the statue, this rule applies to political organizations, charitable organizations, and religious proselytizers. Solicitors may not attempt to contact residents between 9 p.m. and 10 a.m. or attempt to contact the same household twice within a 14 day period for the purpose of a sale (except with permission of the homeowner). Louisville, Kentucky has an ordinance(§ 115.361)that prohibits solicitors from attempting to sell their products or services at any residence displaying a sign with the words “No Peddlers,” “No Solicitors,” “No Trespassers,” or other phrases with similar meaning. Soliciting is only allowed between the hours of 9 a.m. and 30 minutes before the official sunset time. It is not allowed on Sundays or on national holidays. The law (Sec 152:152c) in Baton Rouge, Louisiana states that solicitation (whether for a commercial, political, charitable, or religious purpose) is prohibited at residences that post a sign that states “No Soliciting.” Those who violate this ordinance could be found guilty of trespassing and fined accordingly. The sign must be displayed visibly at the entrance to the property. Salespeople are required to obtain a permit before they begin their work. Baton Rouge limits door-to-door sales to the hours between 9 a.m. and 6 p.m. The city of Portland, Maine’s local ordinances require “transient sellers” to obtain a license from both the city and the state of Maine in order to do business. This law does not apply to those who are going door-to-door in behalf of a “bona fide non-profit organization.”See Sec. 19-56 of Portland’s municipal code for more details. In Baltimore County, Maryland, solicitors may not attempt to sell merchandise at any residence displaying a “No Soliciting” sign (21-11-106). If a community posts signs that prohibit soliciting at all vehicle entrances, solicitors are not allowed to contact any of the homes in the community. The law further states that salespeople may only go door-to-door between the hours of 9 a.m. and 5 p.m.Those who violate either of these rules could be charged with a misdemeanor and fines up to 100 dollars. Although the laws governing soliciting in Boston, Massachusetts are somewhat sparse, the city code contains an ordinance that makes it illegal for solicitors to continue to engage a person “who has informed the solicitor by words or conduct that such person declines the solicitor’s request” (16-41.1). Local regulations in Grand Rapids, Michigan state that salespeople must not attempt to contact households who have posted a sign that states “no solicitors,” “no peddlers,” “no salespeople,” etc. (Sec. 7.261).Solicitors may not call at any residence before 9 a.m. or after 9 p.m. unless they have an appointment. Licenses are required of those who are selling goods or services, but not of representatives for charitable, religious, and political causes. However, religious, charitable, and political canvassers must obey solicitation signs and hours restrictions. The Minneapolis Code of Ordinances makes it illegal for any solicitor or peddler to call at a residence that posts a sign that states “No Peddlers, Solicitors or Transient Merchants” or comparable words. The sign must be posted near the front door to the house use a font size 48 or larger and be at least 4 inches tall and 4 inches wide (Sec. 332.90). This exclusion does not apply to non-commercial representatives (for example, those representing religious groups, charities, and political causes). By law, commercial solicitors are required to be licensed by the city of Minneapolis and Hennepin County. They must also register with the city and obtain a solicitor identification card. According to the law in Jackson, Mississippi, solicitors are not allowed to contact any residence that has posted a sign “clearly indicating that solicitations are not welcome on the property” (Sec. 94-2(b)). Salespeople are not allowed to solicit before sunrise or after sunset and must register with the Jackson Police before they begin to sell within the city. Those who violate these requirements could be required to perform community service, pay fines, or even serve time in jail (depending on the number of offenses). The penalty for breaking this law could be up to a $1,000 fine or 6 months in jail. The city code in Billings, Montana makes it illegal for any salesperson to “[continue] to solicit a person who has made a negative response. Moreover, solicitors may not solicit on private property “if the owner, tenant, or lawful occupant has asked the person not to solicit on the property”(Sec. 18-1001).Assuming that a sign constitutes a negative response, if you post a sign at or near your door that states that solicitors are not welcome on your property, they are not legally allowed to attempt to make a sale. Anyone who disobeys this law can be fined up to 500 dollars. Omaha, Nebraska prohibits any person (whether working for a commercial or non-commercial cause) from leaving advertising material or disturbing the privacy of any residence that contains the words”No Trespassing,” “No Peddlers or Agents,” “No Advertisement” or any similar phrase (Sec. 3-25). We assume that this would also make attempting to contact households with “No Soliciting” signs illegal. What happens in Vegas may stay in Vegas, but door-to-door salespeople can’t stay on your porch if you have a sign that says “No Peddlers or Solicitors” (or something similar) posted near the entrance to your house (see 6.62.120 of the Las Vegas Code of Ordinances). In order to sell commercial goods or services within the city, solicitors must obtain a permit and work card from the city of Las Vegas. The salesperson must be prepared to show either the permit or the card to any people (including consumers) who ask to see them. This means that if you are worried that a particular salesman is not legitimate, you can ask to see identification that states that they have been approved by local authorities. The city of Nashua, New Hampshire’s municipal ordinances (§ 231-13) state that no solicitor is allowed to “enter any house, building or premises where there is posted on the front of the house, building or premises a written notice stating that vendors are not desired.” Put differently, if you put up a sign that states “No Solicitors” or “No Vendors,” salespeople are legally prohibited from knocking on your door. Any salesperson who ignores one of these signs could lose their vendor’s license (which they are legally required to obtain before attempting to sale their wares) and be fined up to $1,000. Registered charitable groups and kids are typically exempt from solicitation rules in Nashua. All solicitors must limit their activities to the hours between 8 a.m. and 8 p.m. If the solicitor is attempting to sell commercial goods or services, they must obtain a permit from the city. While the “physical sign” spoken of refers to a physical motion or body language, you have the right to expect a solicitor to leave you alone after you say no. Moreover, the Supreme Court has repeatedly ruled that posted signs are a way for homeowners to express that they refuse a solicitors proposals. Local laws (25-0510) in Fargo, North Dakota forbid solicitors from approaching dwellings (apartments, houses, etc.) that post a 3 by 4 inch sign that states “No Solicitors” in 1/3 inch letters. The sign should be posted visibly near the entrance to the house. Solicitors are not allowed to approach any residence after 9 p.m. or before 9 a.m. and are also required to obtain a solicitation permit from the city before they begin working in Fargo. Religious, charitable, and political organizations are not required to have this permit. In Columbus, Ohio it is illegal for solicitors to attempt to contact residences that display a sign that states “no peddling, “No Soliciting” or “no canvassing” (Columbus Code of Ordinances 523.14). Solicitors must limit their activities to the hours between 9 a.m. and 8 p.m. and are required to obtain and display a solicitor identification card from the city of Columbus. If a salesperson is not wearing their identification, you have the legal right to request that they show it to you. They must also be licensed by the city prior to going door-to-door. Those who are soliciting on behalf of a school or a religious, charitable, or religious group are not required to obtain a permit or wear identification. Like many cities, Oklahoma City does not allow solicitors to contact any households that have posted a sign that says “No Solicitors,” “No Trespassers,” or “No Trespassing,” since by doing so the person “has indicated his/her desire not to be contacted for sales or solicitations” (§ 39-19). Since Oklahoma City law defines solicitors primarily in terms of commercial sales, this requirement may not apply to religious, charitable, and political canvassers. Tulsa has similar regulations (Section 2903) that prevent salespeople from soliciting residences that have posted a “No Soliciting” sign or placard. There is also a soliciting curfew after 7 p.m. and before 8 a.m. If any solicitor ignores your sign or knocks after the approved hours, the city of Tulsa suggests that you call the Tulsa Police Department at (918) 596-9222. If you don’t want to receive advertising flyers, you can also post a sign that states “No Handbills” or “No Advertisement” (or add that notice to your “No Soliciting” sign). The city of Salem, Oregon’s laws (95.220) make it illegal for people to leave handbills or other advertisements on private property without written consent from the owner. By posting a sign that expresses your wish not to receive advertisements, you explicitly say that you do not give your written permission. Unfortunately, we were not able to find any ordinances related to “No Soliciting” signs specifically in either the city of Salem or the city of Portland. Pittsburgh, Pennsylvania’s local laws require solicitors to be licensed with the city before they can legally go door-to-door. In order to obtain this license, a person must provide their personal information to the city. Thus, if you are concerned about a particular salesperson, you can check with the city to make sure he or she has obtained the appropriate licenses to work within the city. The municipal codes in both cities also forbid solicitation between the hours of 9 p.m. and 9 a.m. Solicitors must obtain a license and a police-issued identification badge before they attempt to make a sale. Sec. 17-97 of the Charleston, South Carolina city code states that soliciting is not permitted on private properties that display signs with the words “No Trespassing,” “No Peddlers,” or “No Solicitors.” Solicitors are required to obtain a permit and keep it on their persons while they are going door-to-door. Charleston ordinances say that solicitors are only allowed to contact residences between the hours of 8 a.m. and 8 p.m.
Door-to-door salespeople may not visit any household after 8 p.m. or before 9 a.m. and must get a permit from the Sioux Falls city finance department before they can begin to sell their products or services. Charitable, religious, and political organizations are exempt from all of the above regulations, as are salespeople who deal exclusively with businesses or government officials. According to the laws in Nashville, Tennessee (6.64.030), no commercial solicitor may enter or stay on any private property that displays a “No Solicitation” or “No Trespassing” sign near the entrance to the property. If an apartment or condo complex posts signs at the entrances to the complex, solicitors may not approach people in the common areas of the complex, but are allowed to go door-to-door unless the individual apartments are listed on the local “No Solicitation List.”This list can be found on the Nashville city website. Residents must sign up with the city each year in order to remain on the list. Nashville ordinances also require solicitors to obtain a solicitation permit as well as a city-issued identification badge. The salesperson must wear the identification badge at all times that he or she is working and must show their permit to any person (police, potential customers, etc.) who requests to see it. Any solicitor who disobeys any of these rules could have their solicitation permit revoked and be fined 50 dollars per day of violation. According to the laws in Dallas, Texas (Sec. 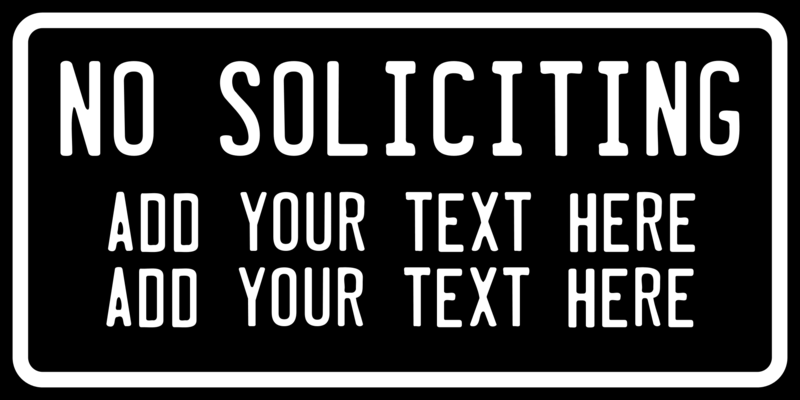 42-21 of the Dallas City Code), if you don’t want to be bothered by door-to-door salespeople, you should post a weatherproof sign that states “NO SOLICITORS.” The sign must be no smaller than 3 by 4 inches, while the letters must be at least 2/3 inches tall. According to the ordinance, solicitors have a duty to look for signs that prohibit soliciting and leave the property without knocking, ringing the doorbell, or otherwise attempting to contact the household if such a sign is displayed near the home’s main entrance. The city of San Antonio also has regulations governing solicitations, though the laws there relate mostly to handbills and other flyers that are commonly left on door handles or steps. Section 21-3 of the San Antonio Code of Ordinances states that person may leave advertisements at any residence that displays a 3 by 4 inch weatherproof sign that states “no solicitation,” “no advertisements,” or “no handbills” in 2/3 inch letters. This law does not, however, apply to government, political, religious, or charitable organization distributing flyers for their respective causes. City ordinances (6.09.170) in Provo, Utah stipulate that a “No Solicitation” sign posted at any residence constitutes notice that the household does not want to receive solicitors. Solicitors are required by law to check for “No Soliciting” signs and leave the premises without knocking or ringing the doorbell if such a sign is in place. Solicitors are also required to register with the city in order to obtain an annual certificate and identification badge. Door-to-door sales and canvassing are prohibited after 9 p.m. and before 9 a.m. The City of Virginia Beach, Virginia’s ordinances place restrictions on door-to-door advertisement. Sec. 23-44.2 of the municipal code states that no handbills, brochures, paper, sample, etc. (whether commercial or non-commercial) may be left at any private property that has “conspicuously posted a “no solicitation” sign or any similar sign which clearly indicates that the owner or occupant of the property does not want to receive such materials.” If a solicitor ignores this sign, he or she could be charged with a 3rd degree misdemeanor. Virginia Beach also requires solicitors to obtain a permit from the city before they begin selling door-to-door. Solicitors in Seattle must also obtain a current license to conduct door-to-door sales within the city. Furthermore, solicitation is limited to the hours between 8 a.m. and 9 p.m.
Charleston, West Virginia’s laws governing door-to-door soliciting (Sec. 18-522) appear to be rather narrow in scope. The city requires solicitors to obtain a license and register with the Department of Consumer Protection. Thus, if you are worried about whether a solicitor is legitimate, you can call the city of Charleston and ask whether the solicitor has taken the appropriate legal steps to hawk their wares. 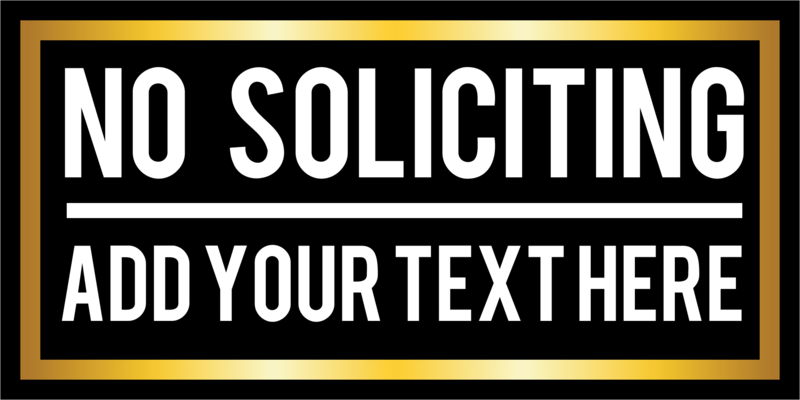 According to section 95-15 of the Milwaukee, Wisconsin code of ordinances, no solicitor may attempt to contact a residence that posts a sign that states “Solicitors Prohibited” (or a similar phrase). Upon seeing the sign, the solicitor is obligated to immediately leave the property. Any solicitor who ignores your No Soliciting sign (or the other regulations below) could be fined anywhere from 50 to 500 dollars. Salespeople working in Milwaukee must register with the police department at least 5 days before beginning to work and should carry an identification card at all times. Soliciting is permitted during the hours after 8 a.m. and before 9 p.m. In Cheyenne, Wyoming solicitors are forbidden from attempting to engage any residence where there is a sign with the words “No Solicitors” or a similar phrase (5.76.050). Other ordinances (8.52.060) make it illegal to leave flyers, handbills, door hangers, etc. at homes that display a “No Trespassing,” “No Soliciting,” “No Peddlers or Agents” or “No Advertisement” sign. Regulations in Cheyenne also require solicitors to obtain and display a city-issued license and limit their activities to the hours between 9 a.m. and 7 p.m.
4th of July Traditions: Old Favorites, New Ideas!